“Adyghe people”, this is how the Circassians call themselves. Why “Adyghe”? The source of the word Adyghe means a noble man, full of virtue, a complete man. Adyghe is the name of the 12 Circassians tribes scattered around the world. This name reflects their aspiration for perfect behavior – an aspiration that includes the codes of behavior passed from father to son. 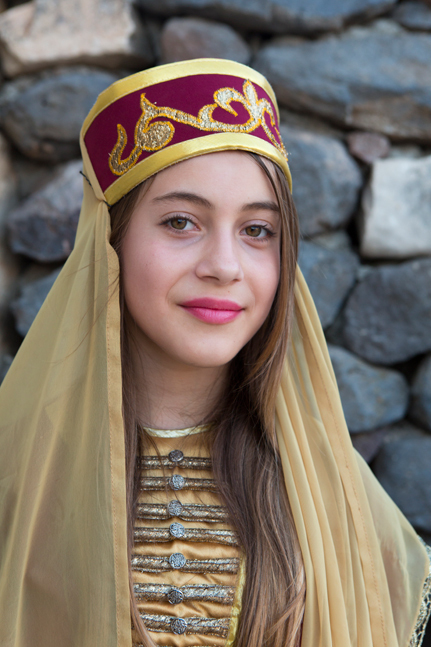 In addition to Jews, Muslims, Christians, Baha’i, and Druze people also Circassians live in Israel. Despite them being a small minority of approximately 4,000 people, they have a distinct culture and character and they keep this distinction – the Circassians are Muslim but they are not Arab; they keep the tradition and customs from the Caucasus but they are involved in the current affairs of Israel. The Circassians come from the Caucasus countries. They were adopted by the Ottoman empire since they were known to be good warriors, after the Caucasus was conquered by Russia. The Ottomans saw them as brave warriors and encouraged them to settle in the far reaches of the Ottoman empire and in this way many of them reached the Mediterranean countries and Israel. In Israel they found much in common with the Jewish Russian immigrants that immigrated to Israel as of 1882. Since their arrival and through the years, a strong bond was formed between Jews and Circassians – a bond that is expressed through unequivocal loyalty to Israel. The Circassians are concentrated in two main settlements: Rihania, numbering about 1,000 residents, in the Upper Galilee, north of Safed and Kfar-Kama, numbering about 3,000 residents, in the Lower Galilee, on the way from the Sea of Galilee to mount Tavor. The Circassians are Muslim and although they practicethe Muslim faith, they retain their costumes from the Caucasus that distinguish them from other Muslims in Israel. The mother-tongue of Circassians is Adyghe but they study and speak also Hebrew, English and Arabic which they learn at school. Be it the fact that the Circassians are a scattered people, like the Jews, or maybe due to their ommon values, the Circassians are fully involved in the Israeli society. As of 1958 they serve in the different enforcing and security forces in Israel: IDF, Police force, Jail-wardens, and go to high schools and integrate in the Israeli society. A visit to the Circassians villages can be a unique experience since you can sense the Caucasus Mountains in Galilee – villages that were as if taken from Russia and brought to Israel – with a building style made of basalt rocks and the street names written in Adyghe. You can tour the narrow alleys, see well-kept house gardens and observe the unique architecture the Circassians brought with them. You can visit the different museums that portray the Circassian culture. The Circassian Museum in Kfar-Kama was founded by a resident of the village and it is where you can view an audio-visual presentation, take a guided tour in the village’s alleys, taste the Circassian Cuisine and enjoy a performance of traditional dances. Alternatively visit the Rihania museum, located at the center of Rihania village, and visit the “Han” museum that tells the story of Hadera, in which the Circassians settled in the beginning of the 19th Century. And if you call on Kfar-Kama, don’t miss out on the Circassians food experience – go to the Circassia restaurant at the entrance of the village and enjoy the best of Circassians cuisine.